ADELAIDE: Veteran wicketkeeper Mahendra Singh Dhoni steered India to a six-wicket victory over Australia in the second one-day international to level the series in Adelaide yesterday. Former skipper Dhoni, playing in his 334th ODI, cooly guided India across the line with four balls to spare to back up a dazzling century from captain Virat Kohli. India successfully chased down a target of 299 runs set by Australia who scored 298 for nine with Shaun Marsh scoring 131 off 123 balls. The three-match series now goes to a decider in Melbourne on Friday after Australia won the opening game in Sydney by 34 runs. Dhoni was physically struggling in the hot conditions and needed treatment from the team physio to finish his match-winning knock and keep India alive in the series. India lost four wickets in their chase after Australia’s total. Shikhar Dhawan hit out before he was snapped up by Usman Khawaja at mid-wicket off Jason Behrendorff for 32 from 28 balls in the eighth over. India were sailing along before Sydney centurion Rohit Sharma on 43 top-edged Marcus Stoinis to deep forward square where Peter Handscomb, looking into the setting sun, took a safe catch to break up a dangerous 54-run partnership with Kohli. Ambati Rayudu was the third wicket to fall caught at deep mid-wicket by Stonis off Maxwell for 24. Kohli was annoyed to get out with the job unfinished and six overs left but Dhoni used his vast experience to get his team safely home. Marsh hammered 11 fours and three sixes, claiming his seventh ODI century and second against India as Australia made the tourists sweat in the field in temperatures hovering around 40 Celsius (104F). India could have been chasing an even higher total if not for the last three overs from Bhuvneshwar Kumar and Mohammed Shami. They took a combined four for 17 in the last 18 balls with Kumar claiming the big wickets of Marsh and Glenn Maxwell. Maxwell had kicked along Australia’s scoring rate with a typically rumbustious knock of 48 off 37 balls coming into bat at No.7. Handscomb threw away his wicket when he rashly tried to sweep Jadeja but was well beaten and smartly stumped by Dhoni on 20. Stoinis was caught behind off a short ball from Shami for 29, and Maxwell produced a lively cameo with Marsh before he was caught at long-off by Karthik. Marsh followed in similar fashion two balls later when he lofted Kumar to Jadeja at long-off. 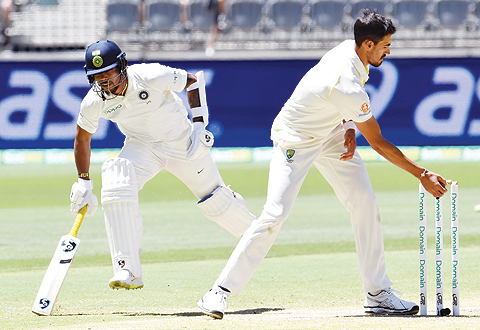 The wickets kept tumbling late in the innings with Jhye Richardson caught at deep point by Dhawan off Shami for two and Peter Siddle was out for a first-ball duck caught by Kohli at deep backward point off Kumar.